nodding trillium blooms in late May and early June at the Bowman Conservation Area, with its flower hidden beneath its three leaves. Showy red anthers – the pollen-bearing parts – dangle from the center of the white flower. Nodding trillium favors the acidic soils of our wetlands. Trilliums often appear near the top of people’s lists of favorite woodland wildflowers, but if you’re treasure hunting for them in Westborough, you’ll need to venture near a wetland to find the only trillium we have in town. Our nodding trillium (Trillium cernuum) is hard to spot. This member of the lily family earned its name from the way its white flower dangles, facing downward, under an umbrella of three diamond-shaped leaves. This nodding posture hides the blossom from view, especially from above. Nodding trillium is less showy than other trilliums with flowers that face upward, but like other trilliums, it’s built of sets of three. It has three petals, three sepals (the leaf-like or petal-like parts that enclose the petals), and three leaves. Its red anthers – the male pollen-bearing parts – number six, so they too come in threes. In summer, the plant develops a red berry with three ribs. Nodding trillium’s three leaves add to the challenge of finding it. They conceal it among the leaves of other plants in our wooded wetlands. For example, nodding trillium grows across the street from the Bowman Conservation Area’s dirt parking lot, on the far side of an old stone wall along Bowman Street. There you’ll have to pick out its three leaves among the three-part leaves of jack-in-the-pulpit (Arisaema triphyllum, Arisaema atrorubens), another wetland plant. Fortunately, jack-in-the-pulpits are also fun to find. Why is nodding trillium the only trillium that grows in our woods? What about all the others? For one thing, nodding trillium is more partial to wetlands than other trilliums, and we do have our share of wooded wetlands in town. For another, the soil in Westborough and much of eastern Massachusetts is too acidic for other trilliums, which favor neutral soil or “sweet” soil with calcium from underlying limestone. Our part of New England was scraped bare by the glaciers, and afterwards the granite bedrock gradually broke down, creating acidic soil in most places, including ours. Fallen pine needles and oak leaves also help to keep our soil acidic. Nodding trillium spreads slowly in its woodland setting. The flower develops into a single red berry with many seeds. Birds may spread a few of the colorful berries, but most berries simply split open and drop the seeds on the ground. Ants then spread the seeds, as they find them and carry them to their nests to feed on tasty parts on the outside of the seeds. This way of traveling means that the seeds don’t go all that far. And barriers that people create, such as roads, may limit where the seeds go. The seeds of the nodding trillium that grow next to Bowman Street are less likely to end up on the other side of the road than other seeds that blow in the wind or get eaten primarily by birds. Sadly, we can see from road kill that roads can be difficult for turtles, squirrels, chipmunks, skunks, possums, and deer to cross, but – strange as it sounds – roads can also be hard for ants and plants such as nodding trillium to cross. Besides spreading slowly, nodding trillium also grows slowly from seed, as do other trilliums. It may take seven years for a trillium to be ready to bloom. After a trillium seed passes its first winter in the soil, it grows a root. The next year, after a second winter, it sends up a shoot. Then for about six years, the plant produces only leaves, investing its energy and storing nutrients in its underground stem. Finally, after a total of seven years, the plant blooms and continues blooming for many years. This slow growth is typical of many woodland wildflowers. These perennials survive the winter and bloom modestly every year, thanks to their investment in underground growth and storage. How can these plants afford this long-term approach to life and reproduction? They can do so because forests are relatively stable environments, dominated by large, long-lived trees. As long as forests aren’t disturbed too much, conditions stay pretty much the same from year to year, especially compared to the frantic growth each year in fields and meadows. Winds, fires, and floods can bring big changes, and so can humans, with our agriculture, forestry, development, and impact on other plants and animals that depend on forests. Trilliums continue in an area if they’re left alone. Picking a leaf may kill a trillium plant. 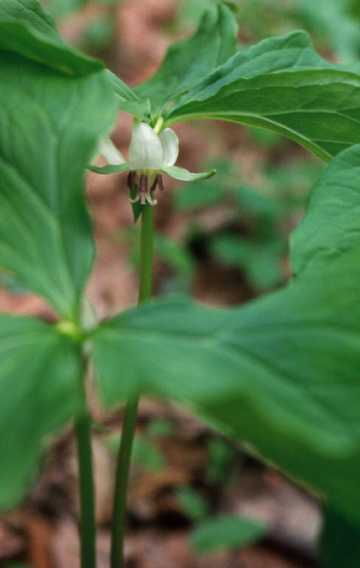 In the past, trilliums were numerous enough in places that people sometimes cooked and ate the young leaves as greens, especially after a lean winter. They gave trilliums the name “much hunger.” Deer also graze on trillium, so it’s bad news for trilliums (and other woodland wildflowers) when an area becomes overpopulated with deer. In days gone by, people also found medicinal uses for trilliums. Nodding trillium was sometimes called coughroot for its use in treating coughs, but generally people used the different kinds of trillium in similar ways. Native Americans and colonists aided childbirth and treated “women’s problems” with trilliums. They used trilliums to treat swelling, bleeding, and skin problems. Trilliums were used in eardrops and eye washes. If you’re patient, trilliums are easy to grow from seed, according to experienced wildflower gardeners. Simply sow seeds in a spot in the garden with moisture, dappled shade, and appropriate soil conditions, and wait a few years. Buy seeds from a reputable source that raises its own plants instead of taking them from the wild, such as the New England Wildflower Society (http://www.newenglandWILD.org). And look for nodding trillium in Westborough’s woods every year after Memorial Day, along with pink lady’s-slipper (Cypripedium acaule) and other treasures.